Review: At 77, director Ridley Scott has directed films across seemingly all genres. Starting with his first film, 1977’s war drama The Duellists to his breakout hit Alien two years later, it was clear that Scott had something going for him. Not that there weren’t stumbles along the way (1985’s Legend, 1992’s 1492: Conquest of Paradise) but for the most part Scott has exceled in drama (1991’s Thelma & Louise), historical epic (2000’s Gladiator) and even the occasional bit of fluff (2006’s charming A Good Year). Still, sci-fi is where Ridley Scott has felt most at home and be it the aforementioned Alien, 1982’s polarizing Blade Runner, or even his more polarizing sorta-Alien prequel Prometheus in 20012 he always (for me) delivers the goods. So it’s with great pleasure that I report that not only is The Martian the best film I’ve seen yet in 2015 but it’s Scott’s most appealing work in years. Based on the hit novel by Andy Weir that’s been well adapted by Drew Goddard (Cabin in the Woods), The Martian is one of those big crowd pleasing epics that audiences won’t see coming. I’d imagine most people will turn up to see an outer-space action film starring Matt Damon (Interstellar) but what they’ll get instead is a full bodied, full blooded, blockbuster in the making that continues to impress with each passing twist. I was worried that Weir’s first person narrative would be tough to adapt but Goddard has fleshed out not only our titular character but a host of his comrades along the way. Now, characters that were intriguing on the page leap to life fully formed and ready to play a part in a rescue mission taking place several light years away. Through a series of unfortunate events, astronaut Mark Watney is left for dead during an emergency evacuation of his team from their Mars outpost. His captain (Jessica Chastian, Mama) and fellow teammates (Michael Pena, End of Watch; Kate Mara, Fantastic Four; Sebastian Stan, Captain America: The Winter Solider, and Aksel Hennie, Headhunters) have no choice but to save themselves after it appears that Watney has perished in a harsh Martian sandstorm. But miraculously Watney has survived, though it can be argued that his current situation is little better than his presumed one. While he has enough food to last a little over a year, the next spacecraft isn’t scheduled to return for another four so he has to put his botanist skills to the test to make his own food supply while staying alive in a small habitat that isn’t designed to last as long as he’ll need it to be. Back on Earth, a NASA authority figure (Jeff Daniels, Looper) has to deliver the bad news of a man dying on his watch but when a tech (Mackenzie Davis, That Awkward Moment) notices some satellite images that suggest someone is still alive on Mars, he teams with the mission leader (Chiwetel Ejiofor, 12 Years a Slave) to devise a way to get Watney home. This choice is mostly to rescue the stranded astronaut but also a tiny way to save face in the eyes of media scrutiny. At nearly two and a half hours, your bladder may shudder in fear but make sure to go before the movie starts because you won’t want to risk missing a single second of the adventure this movie takes you on. The running time flies by due in no small part to Scott’s skill as a director and Matt Damon’s bravura performance. 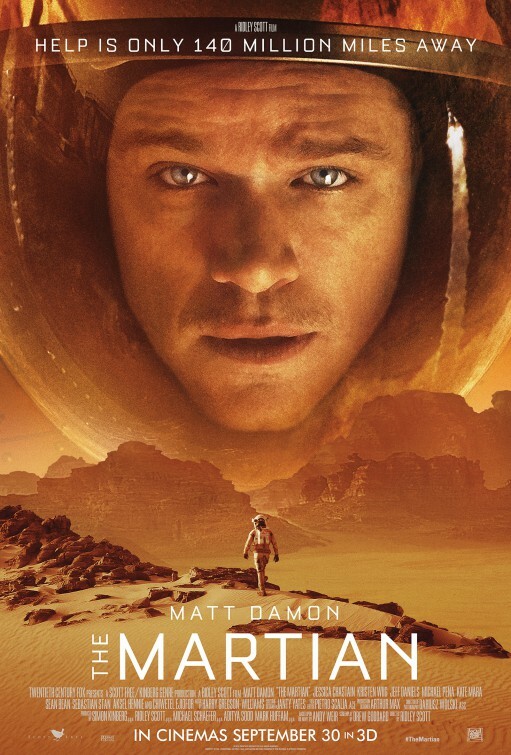 If we didn’t care about Watney or like Damon the film would have sunk faster than the other movies about Mars released in the past two decades (though I liked John Carter better than, well, everyone). The Martian is a nice opportunity for Damon to show some nuance that sometimes feels lacking in his roles lately. His is a powerful, mesmerizing performance and it should easily put him on the short list for Oscar recognition. From Damon on down the cast is excellent. I was wondering why Chastain would take such a ho-hum role, until a late in the game Hail Mary that I won’t spoil tells me exactly what attracted her to the part. Daniels is appropriately gruff, Ejiofor is galvanizing, and what a treat to see Kristin Wiig (The Skeleton Twins) as serious-minded media correspondent for NASA. As the characters are introduced it felt like an abundance of riches and their presence makes the film that much more polished. With the advancement of special effects it seems like anyone can make you believe that you’re in outer space floating weightless but there’s something truly incredible about the production design and visual effects on display here. Seamlessly integrating green screen technology, it’s the first film in a long while where I couldn’t tell where the effect ended and reality began. Couple that with Harry Gregson Williams’s gorgeously haunting score and exemplary cinematography by Dariusz Wolski and you have a film that’s a real stunner. I can’t remember the last time I left a film so fully satisfied and, better yet, energized. Rocketing to the top of Best Picture frontrunners, the film has all of the elements that could help it nab the top prize. We’re pretty far off from the final nominees and the dramatic films seem to rise to the top of the pile but I’m going to be pulling for The Martian to find its way into the mix. Don’t miss it and feel free to spring for the 3D too, the effect works well to give Mars a unique depth while letting computer read-outs pop out at you. Seriously…not to be missed. This film sounds so amazing, nice review of it.